WOODS HOLE OCEANOGRAPHIC INSTITUTION—More than 4,000 years ago, the Harappa culture thrived in the Indus River Valley of what is now modern Pakistan and northwestern India, where they built sophisticated cities, invented sewage systems that predated ancient Rome’s, and engaged in long-distance trade with settlements in Mesopotamia. Yet by 1800 BCE, this advanced culture had abandoned their cities, moving instead to smaller villages in the Himalayan foothills. A new study from the Woods Hole Oceanographic Institution (WHOI) found evidence that climate change likely drove the Harappans to resettle far away from the floodplains of the Indus. Evidence for this shift in seasonal rainfall—and the Harappans’ switch from relying on Indus floods to rains near the Himalaya in order to water crops—is difficult to find in soil samples. That’s why Giosan and his team focused on sediments from the ocean floor off Pakistan’s coast. After taking core samples at several sites in the Arabian Sea, he and his group examined the shells of single-celled plankton called foraminifera (or “forams”) that they found in the sediments, helping them understand which ones thrived in the summer, and which in winter. Sure enough, based on evidence from the DNA, the pair found that winter monsoons seemed to become stronger—and summer monsoons weaker—towards the later years of the Harappan civilization, corresponding with the move from cities to villages. 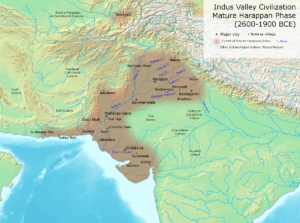 The rains in the foothills seem to have been enough to hold the rural Harappans over for the next millennium, but even those would eventually dry up, likely contributing to their ultimate demise. Also collaborating on the study was Ann G. Dunlea, Samuel E. Munoz, Jeffrey. P. Donnelly, and Valier Galy of WHOI; William D. Orsi of Ludwig-Maximilians-Universität Munchen; Marco Coolen and Cornelia Wuchter of Curtin University in Australia; Kaustubh Thirumalai of Brown University; Peter D. Clift of Louisiana State University; and Dorian Q. Fuller of University College, London.